Important stuff today… But I don’t know of a good point to cut it, so just click the “see more” button. First off is something a few of us might be doing, but I’ll be the first to announce. This season we’ll finally be making use of the fact that we have a CommanderCast YouTube. My series there will be called “Wanderlust”. Why Wanderlust? Because it seems fitting… And because the Gatherer random button told me to. While I have a few ideas prepared, much like this article, the content isn’t likely to follow a given theme. Expect tech, gameplay, comedy… and… other things. It’s going to take a lot of time recording, setting up, and editing; so the first episode probably won’t be out for a few weeks. I had planned on doing something quick for you guys, but real life scheduling conflicts (or, rather, the limitations of internet access at certain institutions that may or may not claim to educate) put a stop to that. I’m the kind of person that likes to pile as many legends as possible into a deck, so long as they fit the theme, and these two seem like perfect additions to my Kresh and Bant decks respectively. 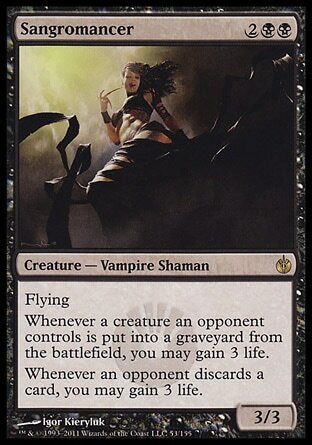 Kresh – Voltron, tokens, death triggers, Vampire and Shaman tribal subthemes. Bant – Theme deck; 22 legendary creatures each which also has a second spell that either has a flavorful or mechanical connection to that legend. Ashnod’s Altar – I don’t actually get to use this all that often; when I do, it’s usually just to get rid of tokens to make Kresh bigger or to combo with Woodfall Primus and Nim Deathmantle. That said, it is a free instant speed sac outlet. Vraska the Unseen – Vraska is actually a fairly recent addition, but for the most part she’s just been a 5 mana Vindicate… But a Vindicate is still a Vindicate, which is why so many people run Karn Liberated. Sangromancer – Pro: 3/3 flier for 4 that gets both of my tribal bonuses and has incidental triggers. Con: Sometimes just a 3/3 flier for 4. Korozda Guildmage – It’s a sac outlet and a token maker, but it costs mana. Tatsumasa, the Dragon’s Fang – Makes things big or makes a dragon, costs a lot. Well, he’s obviously not overlapping with Joiner Adept in any areas but the mana curve, that leaves a sac outlet and a tribal relevant body. 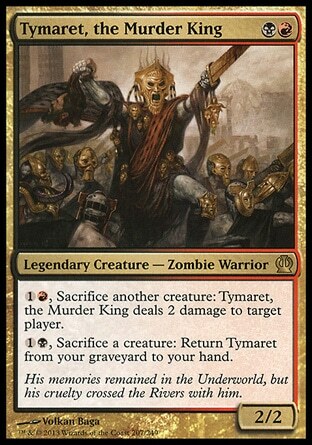 Given the Voltron aspect of the deck, I think the ability to consistently recur him is better than rather insignificant tribal synergies so, sorry Sangromancer, look’s like you’ve been cut; maybe you’ll find a home in the next Necropotence deck I make. Wow… Actually writing this out for an article as I make the changes really helps… I’ll have to try doing it this way more often. 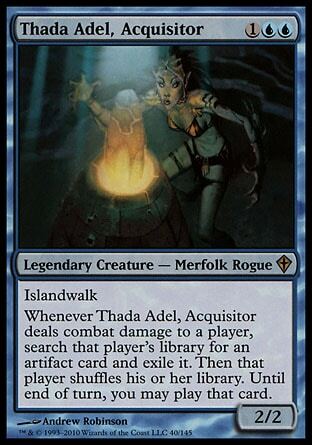 Next up is a bit more complicated, to fit Thada Adel into my Bant deck, I also have to find a card that pairs well with her, and there isn’t one already in the deck. Chromeshell Crab/Legerdemain – Control exchanging is kind of like stealing… But it would be the only morph card in the deck. Psychic Surgery – She makes them shuffle, so why not punish them again for being hit? Domineer – Artifact stealing… With the restriction that it must be an artifact creature. Fabricate – Find my own artifacts! Shuffling is probably more common than me wanting one of the few artifacts in this deck, and chancellor isn’t guaranteed to work, so she’ll be performing surgery whenever she hits. But who do I cut for her now? Masako the Humorless and Gustcloak Savior – Both of these rarely ever matter, so much so that I don’t think I’ve ever actually played Gustcloak Savior. Krond the Dawn-Clad and Verdant Embrace – Cutting these would have a nice impact on my curve, there also aren’t enough auras in the deck for Krond to reliably be anything other than a mana-unfriendly Serra Angel. After a bit of thought, I think I’ve only ever cast Krond once, that’s how bad he is on mana… A pretty easy cut to make. That was fun, but constantly going over changes to my own decks would probably be a bit boring, this seems like it could be a good audience submission/interaction piece. So, if you’re having a hard time making a cut for one of your decks and would like my opinion, email me your decklist and the card(s) you want to put in at chaosmtg@gmail.com and you might get a spot in an upcoming Making the Cut segment.